Landis Fields is a 3D Concept and Visual Development Artist working in the film and entertainment industry. 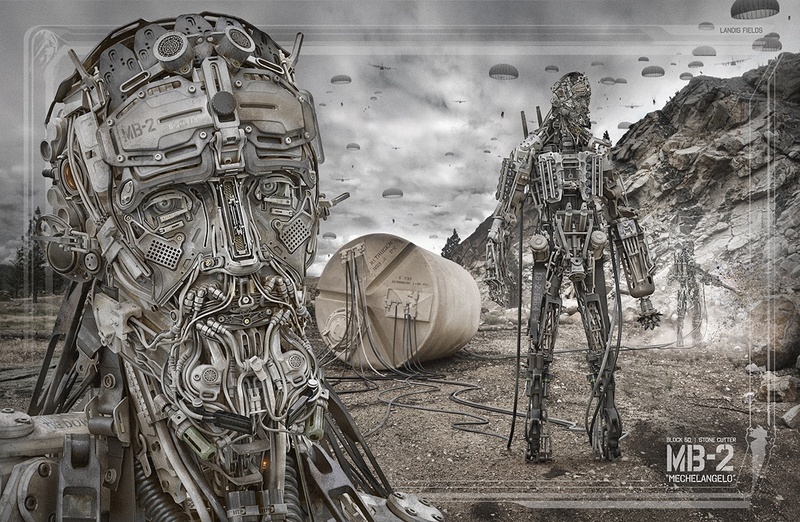 He's also a KeyShot user with work regularly featured on many websites, in various magazines and books. In fact, the image he has shared with us today is for the upcoming charity art book by Design Studio Press called "Nuthin' But Mech Volume 2". The book will be released December 1st, but thanks to Landis, we have the opportunity to show you the image he created, provide the story behind and see how 3D printing is being used to visualize the 3D print. The MB-2 Block 50 stone cutter, a.k.a "Mechelangelo", is a multi-roll terradrone maintained by the United States Air Force. This remote "bunker buster" is dropped from an AC-130 via parachute to assist combatants in gaining access to mountainous hideouts by carving out troublesome terrain and other geographical obstacles in the field. It's modular payload consists of 1 water saw w/interchangeable bits and 1 "pieta" pod for ballistic slug seeding when roughing. There are a few hidden messages in the painting...for example when Michelangelo was a child he was taunting another boy who ended up breaking his nose (which is why it looked the way it did as an adult). I thought that experience would have stayed with him his whole life which is why I represented his nose as a comm port that connects to a storage drive deep within the skulls chassis. Also, the foreground guy on screen left represents his birth (hence the serial number on the forehead), the mid ground guy is his death, and the background guy is the afterlife since his last ambition before he died was to carve out an entire mountain. There are more hidden messages throughout the composition but Ill leave a little to the imagination. Here's the full image of the piece. Not only has Landis created KeyShot renders of the artwork but also pre-visualisation KeyShot renders of the 3d print prior to fabrication as well as the actual final prints themselves. He's given us a sneak peek at these as well. Below is an image showing a few angles photographed of the 5 inch tall 3D print AND an image showing the KeyShot renders used as previz for the 3D print itself. The photographer of the 3D print photo is Zac Wollons. Landis tells us that "Despite the complex nature of this design and high standards held by Design Studio Press for render resolution, KeyShot chewed it up without breaking a sweat." They look fantastic and we came to find out that 3D Artist/TD "Duncan Graham helped me process a life-size version of the head that Studio Fathom is printing next." A life-size version of the head. This will be be impressive. "Currently, I'm also working on printing Mechelangelo on a B9 Creator resin based DLP printer, the Formlabs Form 1 and the Makerbot Replicator 2X FDM machine as well."